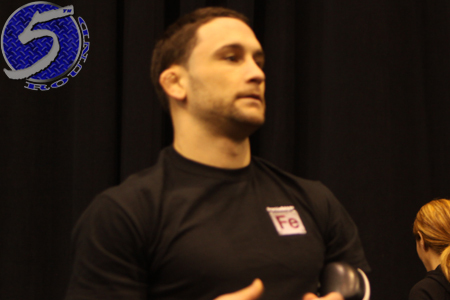 Frankie Edgar (Pictured) will be entering his sixth consecutive title fight this Saturday, but for the first time since April 2010 he’ll be stepping into the Octagon as the challenger. That won’t be the only change come UFC 150, Edgar claims he’ll be a different fighter than in his initial encounter with Benson Henderson. I guess that’s a good thing considering Edgar lost a unanimous decision to Bendo in February. Edgar hopes to turn the tables inside Pepsi Center in Denver. He’s 2-0 in championship rematches, so “The Answer” has had a knack for finding the solution when it comes to sequels. One thing many pundits believe he’ll need to adjust is the amount of punishment he inflicts, as opposed to receives. While Edgar agrees with the assessment, sometimes old habits simply die hard. “Ben’s never had a black eye or a broken nose in any fight,” Edgar shared. “So I don’t know if I’m gonna be that guy [who finally does it]. Some guys can take damage better than others. Me, I get beat up a little bit in my fights – whether I win or lose. Saturday’s contest could mark Edgar’s final lightweight affair for a while. UFC president Dana White has long been pushing him to drop a weight class. So instead sliding down the 155-pound totem pole with another loss, it would make most sense for him to shed 10 pounds and challenge for the featherweight crown. However, Edgar isn’t trying to hear that chatter and it could be a moot discussion if reclaims his crown. Perhaps “The Answers” will come Saturday.